Self portrait of me in the Terry Badlands during my winter road trip that helped me fall in love with this region. Making the journey down from Sidney on the Missouri River Country part of my Montana Spring Road trip I decided to take my “day off” in Makoshika State Park. Now joined by my friend, and trip videographer, Lyman Gillen, we mountain biked the hills and involved ourselves in general shenanigans. The next morning Nathan Satran, Lyman Gillen, Nathan’s girlfriend Courtney, and I headed off to the small town of Terry, Montana. 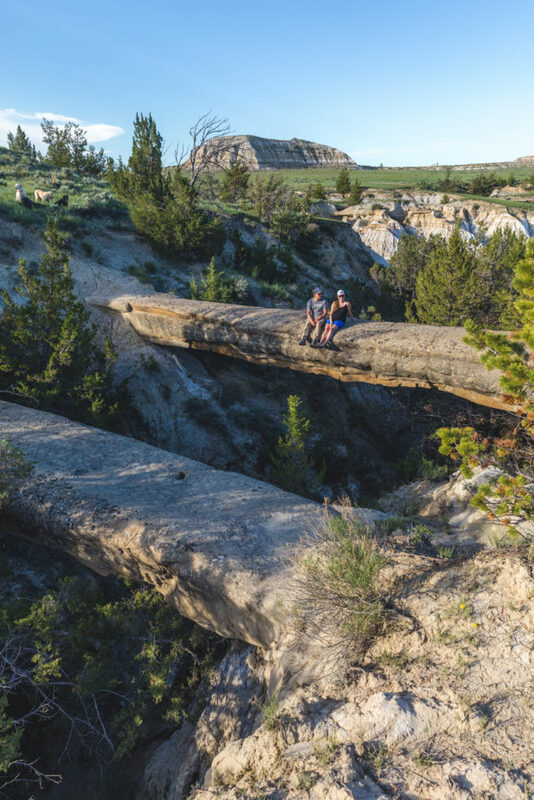 Terry is home to the Wilderness Study Area, the Terry Badlands, and a terrain that is as beautiful as it is unforgiving. We explored town, and visited our favorite Montana gift shop, Prairie Unique to catch up with the owner, Dale (an old buddy of mine from my days working with SEMT). After a trip to the Evelyn Cameron museum, a ghost tour through the historic Kempton Inn, and lunch at the Hog n Jog we were finally ready to get our boots dirty. 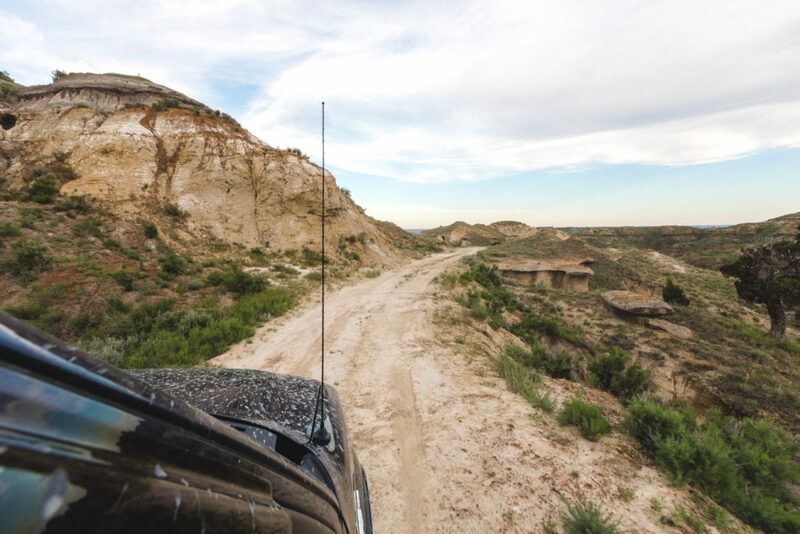 We hoped in the trucks and headed out for the Calypso Trail, a roughly ten-mile dirt road that winds through the badlands. At the end of the road was the hike we were after, the one-mile hike to the Natural Bridges. 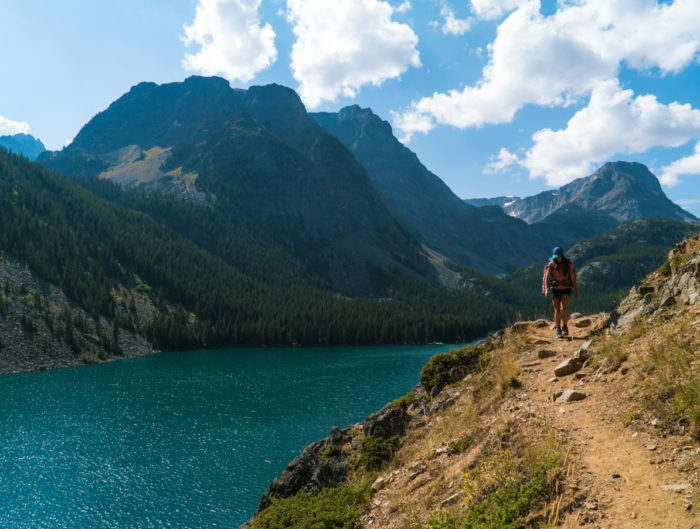 As we hiked it is important to notice a bit of advice on safety. The badlands are rattlesnake country, and boots should be worn for this hike. We encountered two rattlesnakes on this trail, and one was a little too close for comfort. We made our way to the Natural Bridges and the sight did not disappoint the stories I’ve heard of this place. Upon seeing a storm building on the horizon we chose to quickly hike out to the trucks, as the Calypso Trail becomes impassable when wet. 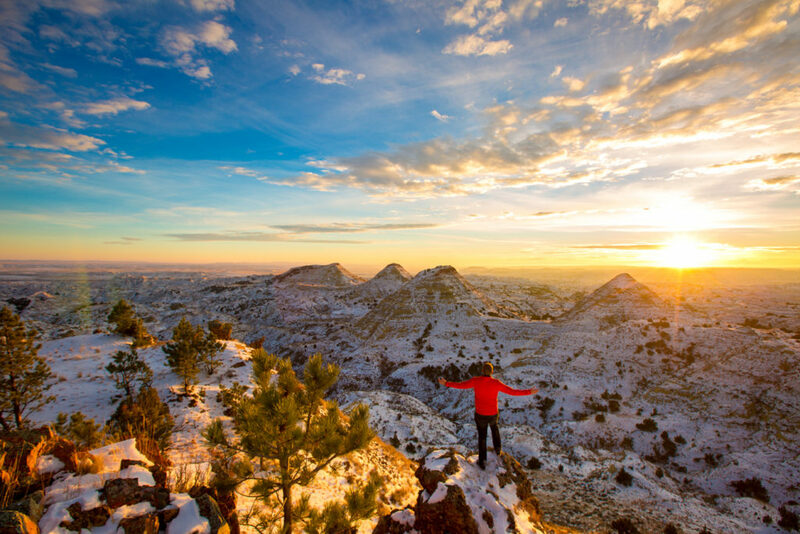 We beat the storm out and made it back to Terry before heading into a different part of the badlands to set up camp up on Scenic View, one of the taller bluffs in the area overlooking the rugged landscape. We watched a beautiful and powerful storm move across the terrain before settling in for the night. The following morning, we woke up to another perfect sunrise as we watched the badlands turn gold as the sun hit them. We finished up a few photos before heading off to that day’s scheduled shenanigans, Bighorn Canyon for an afternoon of boating. Making the drive into Crow Country isn’t complete without a stop at the Custer Battlefield Trading Post for Indian Tacos made on traditional fry bread, it was a twenty-minute detour from the fast route but an easy choice. 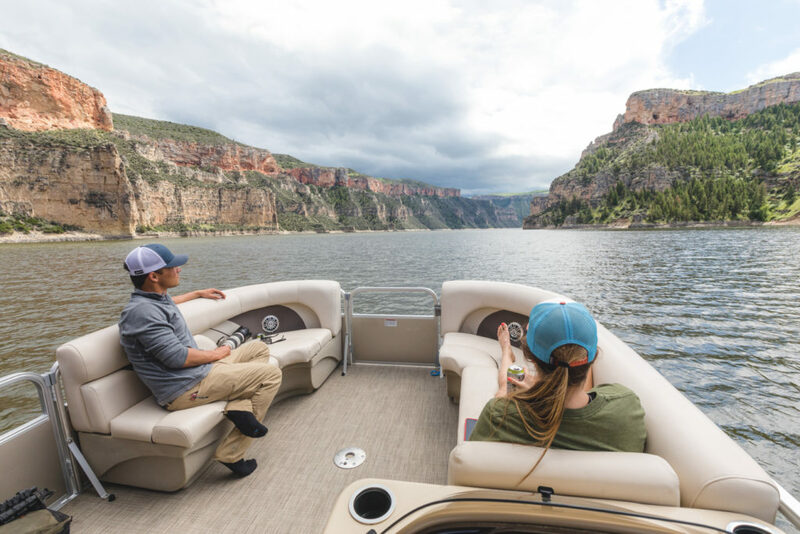 We had reserved a pontoon boat from the Ok-a-beh marina just above the Yellowtail Dam in Bighorn Canyon. The process was easy, they have a text-only line to reserve a pontoon boat for half or full day, that number is: 406-623-9281. 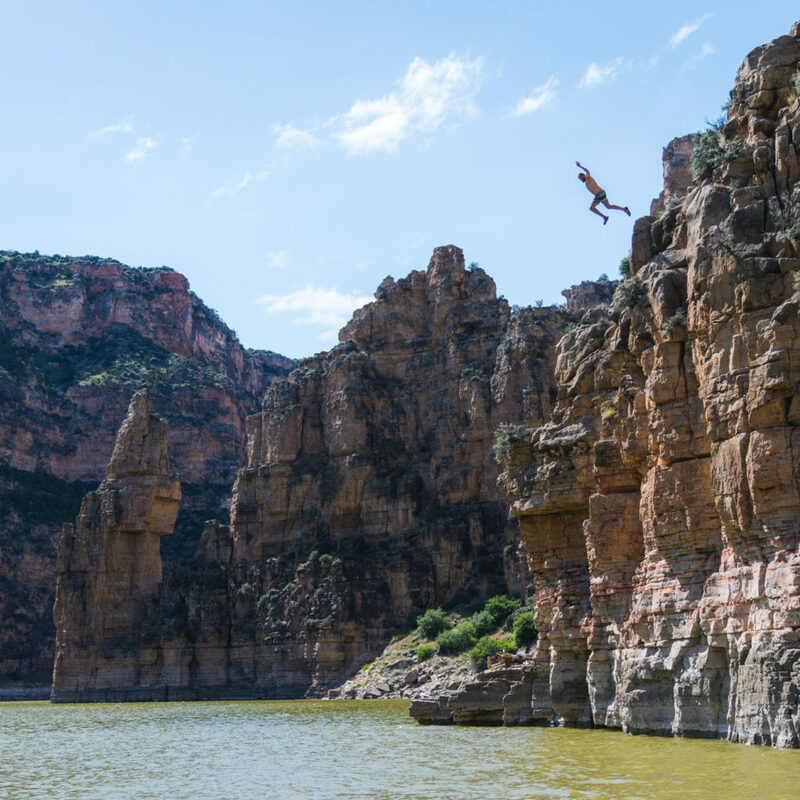 As someone who spends a lot of time exploring Bighorn Canyon from the top and looking down, it was a pleasant change to spend the afternoon boating the lake and looking up at the brilliant canyon walls. We saw only one other boat on our four-hour tour of the lake, and that, to me, is paradise. The canyon walls were too tempting and we continuously tried to find a good spot to jump from, which isn’t a hard feat as the canyon walls jut straight down, making the perfect cliff-jumping opportunities. Lyman and I finally locked eyes on the perfect cliff, with a fairly-easily accessible climb to the top. Although, it looked a lot higher from the top than it did from the bottom, well I started having second thoughts. Figuring it to be between 30-40 feet we quickly realized it was a lot higher once our feet left the canyon walls and we were greeted with a long enough fall time to really question why we were jumping. Turns out the cliff was a roughly 60-foot jump, but I would do it all over again in a heartbeat! We had brought two kayaks with us into the canyon, and I was able to use one to explore up one of the more narrow fingers of the canyon that the boat couldn’t make it up. The high red walls looked more like Utah than what you would expect from Montana, but that is why I love this place! 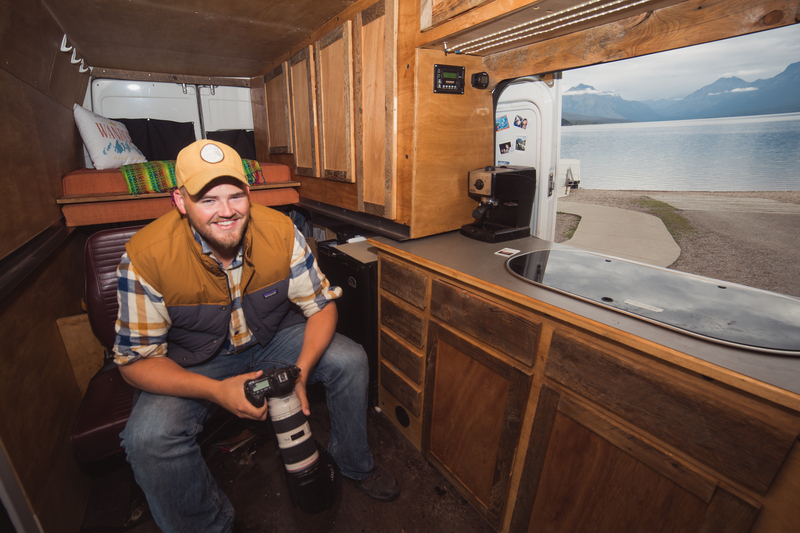 As I leave Southeast Montana I turned my sights on Yellowstone Country, so stay tuned for another edition of the Montana Spring Road trip coming soon! Check out this map of my roadtrip! Southeast Montana took up days 3 and 4!